So I tried four new things tonight -- two mostly from a recipe, and two from my head. The two from a recipe were basic white/wheat bread and mashed potatoes, out of Joy of Cooking. 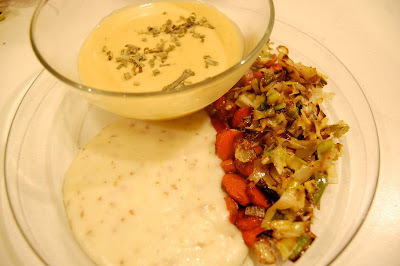 The two without were what I'm calling Sweet Ginger Carrots with Leeks, and Cream of Squash Soup. More about those last two later. Unfortunately, I decided to use my Cuisinart instead of a masher to make the potatoes, and they ended up being potato puree. I did originally try a ricer, but it was going so slowly that I gave up. I really need to learn how to properly use a ricer. I should have gotten out my manual masher, but just didn't think about it, so into the Cuisinart the potatoes went. The flavor (check out that Joy of Cooking recipe -- it has garlic, celery, bay leaf, etc) was awesome, but the texture left much to be desired. I'll definitely remember that for the future. The bread is currently in the oven, but there were two major issues. The first is that it is very possible that I was using old yeast. And that, I've heard, is not a good thing -- your bread just doesn't rise. When I set the bread aside in a warm spot, it basically just didn't expand at all. The second problem was that when I opened my white flour bag, it was full of gross bugs that looked to have been breeding there for a while *ICK! * Fortunately, I hadn't used it in a while, so I'm not too worried I've been downing, um, extra protein. I sent the fiance to the store for some more white and threw the nasty flour in the trash, but my understanding is that timing is important when adding yeast to the dough, and I'd already done that with the wheat flour. So I had to leave the dough sitting for 20 minutes until he came back with more white flour. I'm blaming these two things for my imminent bread failure, and hoping to more successfuly explore baking further in the near future. And now for the successes. W00t! 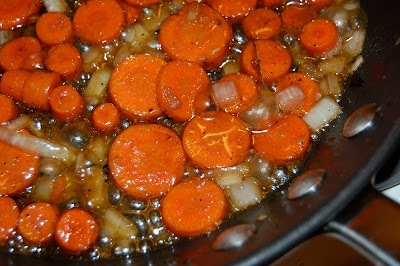 I sliced two large carrots to a medium thickness, and added them to a medium nonstick saute pan with about three tablespoons of butter, salt, pepper, half a diced white onion, a tablespoon or so of pinot noir, and about 2/3 tablespoon of pre-minced ginger. That pan got a lid, and about halfway through the cooking process I added about a tablespoon and a half of brown sugar -- late enough so it didn't caramelize too much and make everything too sticky/overbrowned. In a separate pan I sauteed some leeks in Trader Joe's (OMG I miss Trader Joe's) black truffle oil and a little white wine, though I got distracted and let them go a mite too long, so a few sides of the leeks were a bit blackened (I threw out the worst pieces). Early in the day, I baked a squash (I think it was acorn, but I'm not certain, as I got a variety bag full of squash from our local growers' membership food co-op, Idaho's Bounty, and forgot what was in the bag). Halving the squash and removing the seeds, I put in the empty cavities about two or three tablespoons of butter, a heavy sprinkle of brown sugar, and a medium sprinkle of powdered red pepper, and baked that whole business until it was soft to a fork, probably a couple hours at 350. This is the easiest thing in the world, and there's so much you can do with the finished squash, I highly recommend it. Later in the day, I sauteed a half-dozen diced raw garlic cloves, two large roasted garlic cloves, two large celery stems, a few slices of white onion, and salt and pepper. I put that and the scooped-out squash innards into the Cuisinart and pureed the whole mess with a tiny carton of heavy cream until smooth. Overall, the meal was a success: the soup and carrots definitely starred the show, enough that the weird potato texture almost got lost. Fortunately, there's some soup left, now waiting for another meal in the freezer. There were also left-over potatoes, which I'm eager to reinterpret in other contexts, perhaps as the plate base for some of the Lava Lake lamb sirloin tips I'll be getting from Idaho's Bounty on Wednesday. If I find something good to do with pureed potatoes, I'll let you know. Akitcheninbrooklyn.com is doing a roundtable on carrots for the month of December. For additional carrot recipes, click here for my Carroty Latkes.